I talked to my sister online yesterday and she told me that my sister-in-law just gave birth to their first baby. My brother was in the hospital with his wife and baby. I was so happy and excited to know that the baby was a healthy and bouncing baby girl. Her name is Vernice Julia. I'm the one who suggested the name Vernice because it means "victory bringer" and they just added Julia because she was born on the month of July. 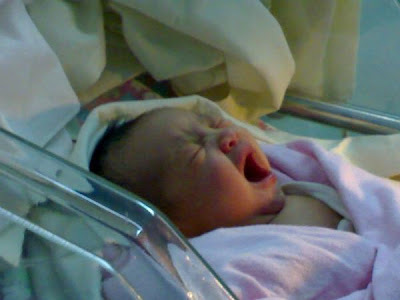 My sister-in-law gave birth via caesarian section. They were expecting that she will have a normal delivery and she was already on labor at the hospital. The problem was, the baby doesn't wanna go down and come out and she had already poop inside. So they decided to perform CS. After I talked to my sister, my brother was online. He just got home from the hospital and he told me the baby was okay and she weighs 7.4 lbs. He showed me the his baby's photos that he took in the hospital. The baby is a cutie. 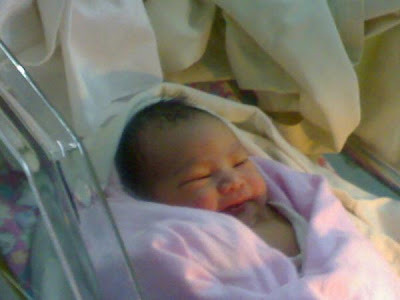 Here she is, Vernice Julia, my newborn niece.